How a business plan will make your business successful. A clear and effective business plan will help you secure the investment you need to help grow your business. Simply put, a business plan is a description of your future business. It documents what your business is, who is going to use it (eg buy your product) and how you are going to make it happen. It may seem like a big task - to document every detail of your business. You may feel you know everything in your head, and don’t feel the need to write down every aspect of your new business, especially if you are not seeking investment. The survey results below may convince you otherwise. Two students from the University of Oregon, partnered with Palo Alto Software to ask people about their businesses, including questions about their goals, years in existence, business planning, finance etc. Almost 3,000 people responded. 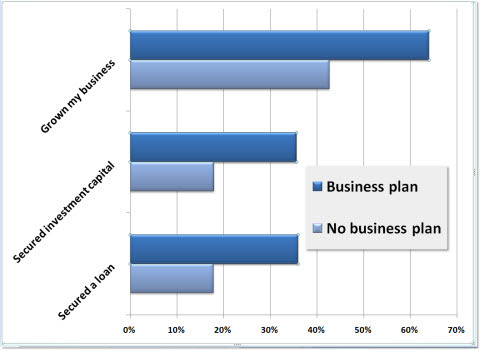 This chart from Tim Berry's blog on business planning shows the results of their research. Those who finished their business plans were about twice as likely to successfully grow their business, get investment, or secure a loan than those who didn’t. So now that you are convinced that writing a business plan is the best thing you can do for your new business, read on to find out about the different sections in a business plan and how to write them.